Why am I not getting my needs met? Conflict, Care, and Love is based on the Pattern System, which is a systematic approach to understanding personality that is oriented toward psychological healing and personal development. 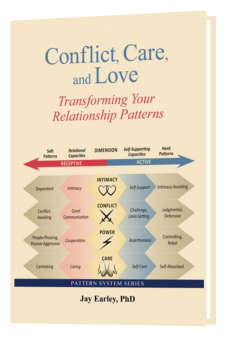 This book covers the four main dimensions of the Pattern System that influence our love relationships—Intimacy, Conflict, Power, and Care. Once you have explored yourself and your partner according to these dimension, you will understand what is working and what isn’t working in your relationship, and what to do about it. Therapists, coaches, and other helping professionals can use Conflict, Care, and Love to understand the detailed psychological structure and dynamics behind their clients’ relationships issues. Dr. Jay Earley has an extraordinary ability to think systemically and to write accessibly. In Conflict, Care, and Love, he translates 40 years of witnessing clients’ struggles to navigate through conflict and develop intimacy into a comprehensive map for personal transformation. This book is a clear, straight-forward approach to identifying the childhood origins of problematic patterns, healing them, and replacing them with new-found strengths such as intimacy, self-support, good communication, assertiveness, cooperation, and self-care. This book can be used as a stand-alone resource for personal growth or as a companion to Earley’s web-based Self Therapy Journey, a groundbreaking approach to self-help that combines his systematic approach to self-healing with cutting-edge web technology. Conflict, Care, and Love is a goldmine of simple yet rich information to help you understand your own and others’ interpersonal patterns. Studying the four most important dimensions—intimacy, conflict, power, and care—will assist you in identifying those capacities you need to develop to manage conflict and enhance your connections. Working through this book will help you to find more understanding, balance, and ease in your relationships. It will be of value in a personal, coaching, or therapy setting. It’s not rocket science to see that we are confused about how to make interpersonal relationships work, especially in our fast-paced, high-tech, low-interaction society. How do we balance all that we have to do in life and healthy balanced relationships too? I found Conflict, Care, and Love to be very helpful in identifying patterns that cause us pain on either end of a spectrum and finding a healthy balance. I will be using this book with myself and my clients.